While there's always heartaches lurking around the corner of Hollywood Boulevard, some celebrity couples are willing to take the risk by holding on to their 'perfect ones'. From Hailey Baldwin and Justin Bieber's shocking engagement to the biggest wedding of the year between Meghan Markle and Prince Harry who are now the Duke and Duchess of Sussex, this year has restored our faith in romance, for sure. Some of them left us in awe of their love and made us fight back happy tears, some were over the top and some couples decided to tie the knot in the most unconventional ways. There were hookups that we never imagined would happen (but they did) and there were some who were lowkey but totally adorable. Let's take a look at the biggest celebrity hookups and weddings that 2018 has brought us so far. Britain's Prince Harry, Duke of Sussex and his wife Meghan, Duchess of Sussex leave from the West Door of St George's Chapel, Windsor Castle, in Windsor on May 19, 2018 in Windsor, England. 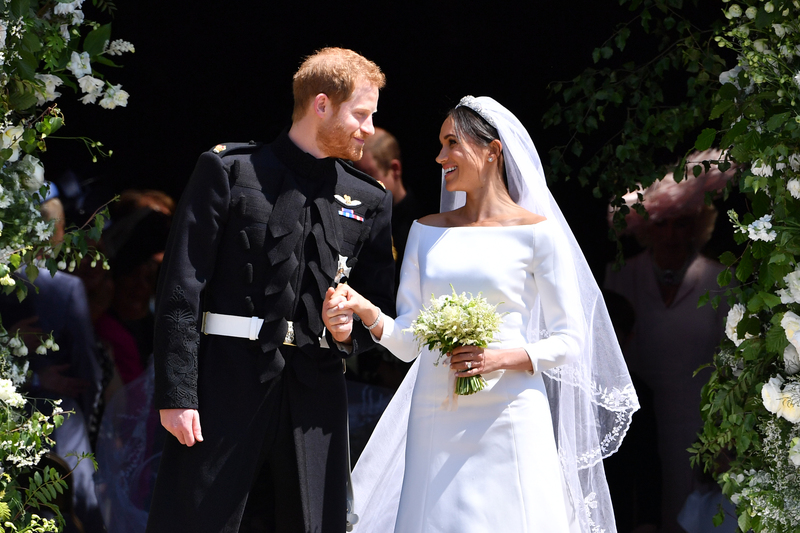 Blind date turned fairytale wedding, 'Suits' actor Meghan Markle and Prince Harry's summer wedding has to be the most talked about nuptial of the year. The couple, who announced their engagement in November last year tied the knot in front of UK's elite in a traditional ceremony this May. After just two dates in 2016, Prince Harry took her on a camping trip to Botswana, proposed to her and the rest is royal history. Priyanka Chopra (L) and Nick Jonas attend the 'Rei Kawakubo/Comme des Garcons: Art Of The In-Between' Costume Institute Gala at Metropolitan Museum of Art on May 1, 2017 in New York City. 'Quantico' star Priyanka Chopra and her beau Nick Jonas have been inseparable lately. 35-year-old Priyanka and Nick, 25 first went out as a couple at the 2017 Met Gala. While they kept things under wraps for a long time, Nick gave it all away after he commented "That smile," on a picture of Chopra and some friends enjoying burgers at In-N-Out. He accompanied the comment with a heart emoji. Since then, they've vacationed in India and Jonas has met her mum and according to reports, even gotten engaged. Looking serious? We think so. These two shocked us all after the word got out that they are engaged. JB popped the question to his on-again-off-again girlfriend Hailey Baldwin on a vacation in the Bahamas. The two first met in 2009 after her dad, actor Stephen Baldwin introduced the two at an event. The couple sparked rumors after Biebs started hanging out with Hailey post the Jelena split in 2014. They denied rumors until 2016 claiming they were just friends, following which Justin posted an adorable photo with her on his Instagram to make it official. He also posted a picture of them kissing soon after. The couple split up again at the end of 2016 and Justin went back looking for love to Selena. As fate would have it, things didn't work out between them and Jailey started seeing each other again by April 2018. The actress and Big Bang Theory star married Cook, a professional equestrian in a sweet wedding ceremony in a horse ranch in July this year. The couple was engaged last November, and her fans were treated to a touching video of Cuoco bawling her eyes out after being proposed to by Cook. The CBS star met the equestrian at a horse show in 2016. The duo made their first red carpet appearance in March of that year. At the time, she gushed about Cook like never before. She said at The Talk, "I can’t stop smiling. Life is so, so good. I finally found my horse guy. It was meant to be. He’s an amazing rider, amazing equestrian and a great human. We shared a passion for horses and dogs … It’s been lovely." Riverdale star Camila Mendes and her nonactor childhood friend Victor Houston declared their relationship for the world to see earlier in June. The couple were rumored to be dating around April. The two went to school together in Florida years ago and reconnected recently in New York City. On her 24th birthday, the couple spent time together in the Hamptons. Victor is a Philosophy major and works in finance. The world was still reeling after Chris and wife Anna Faris shocked us with a split announcement last year. Soon Pratt was rumored to be dating Katherine Schwarzenegger, the 28-year-old daughter of Arnold Schwarzenegger and Maria Shriver. The duo was spotted on a picnic together last month in Santa Barbara, California, both smiling big and clearly enjoying themselves. The summer romance was confirmed when recently more pictures of the two engaging in PDA was splashed on the Internet. It wouldn't be wrong to say that Jailey totally took inspiration from Ariana Grande and Pete Davidson. The two met on the sets of SNL in 2016 but Ariana was with Mac Miller and Pete was dating Cazzie David. Cut to May 2018, she announced her split with Miller and soon after Pete and Grande were spotted together hanging out at a club with Pete's mum. Soon after Pete announced his breakup with David following which fans noticed that Ariana and Pete had matching tattoos! By the end of the month, the two were Instagram official. Pete posted an adorable photo of the two dressed in Harry Potter garb with the caption, "The chamber of secrets has been opened". If you thought this was going too fast then you still haven't gotten the vibe - the couple, just about two weeks later announced their engagement on Instagram. The couple has a gazillion adorable posts on Instagram and quite a few tattoos dedicated to each other. Emma Watson and Chord Overstreet. British actress Emma Watson is known to be super private about her life, so when pictures of her and 'Glee' actor Chord Overstreet started making the rounds, one couldn't help but wonder if it was just speculation. But, bless the universe because they actually were dating. The first picture of them popped up on Twitter after a fan posted the two of them looking loved up at a Nathaniel Rateliff & the Night Sweats concert at West Hollywood’s Troubadour. A month later, the two were spotted leaving the Vanity Fair Oscar party. In the paparazzi footage, you can see Emma leaving the party with Chord not too far behind. And if you look close enough, you'll notice that Emma is wearing an oversized suit jacket, which most likely belongs to Chord. A few months later, however, it looked like the relationship had come to an end, with a source close to the couple announcing the news to Page Six. Then less than a month later there was another picture of them kissing on an LA street. This sure seems proof that things are back to normal. Well done, Hermoine! This adorable couple was spotted locking lips after Valentine's Day dinner this February. Lucy was seen holding a pink rose and eyewitnesses said that "She leaned over to kiss and hug him a few times during this period and was also seen sucking his lollipop that the restaurant gives to their customers for after the meal." The 'Life Stence' co-stars started dating about nine months after Hale split with her boyfriend, Anthony Kalabretta. The couple have split up now. After being linked to Shawn Mendes, Camila started dating relationship guru Matthew Hussey and the pair were first spotted together kissing on a beach in Mexico in early 2018, around the same time that Lucy and Riley started seeing each other. Matthew is a British YouTuber who claims to be the world’s leading dating advice expert for women. Seems like he took his own advice quite seriously. Amber Heard and Tesla giant Elon Musk started dating in 2016. The actress had been earlier married to actor Johnny Depp. The two have always had a turbulent relationship since then. They went public with the relationship a year later but then split up again in August 2017, citing busy schedules as the reason. This year, adding another chapter to this confusing saga, the two were spotted out together in January 2018 holding hands as they left a sushi restaurant in Los Angeles. After a few months of dating, they called it quits once again. This was a dreamboat for One Direction fans! After Zayn found love with supermodel Gigi, Niall found his heart a home in Hailee Steinfield. The romance was never as open as Ariana and Pete's or even Millie's - they were seen having dinner in May at Los Angeles hot spot E.P. & L.P. and indulging in some subtle P.D.A. Niall is said to have had his arm around Hailee and they were holding hands. This was the confirmation to the rumor mill's guess after the two were seen singing and grooving to a Backstreet Boys show in February and later in April last week the two were reportedly seen kissing at BBC Music's Biggest Weekend in Swansea. Everyone's favorite Olympic hottie Adam Rippon left fans scratching their heads after he posted on Instagram a photo of himself and a man on a shirtless hike in Los Angeles' Runyon Canyon, writing, "Good boys Finnish FI first." He then later confirmed that it was Kajaala, who he had been speaking to for 7 months and that the whole thing was pretty fresh. Jussi-Pekka Kajaala is a native of Finland The two are said to have met on Tinder and made the decision to swipe right! Everything Amy Schumer does, she does it loud and proud! After she and chef Chris Fischer sparked romance rumors in November 2017 when they were seen having dinner in NYC, the two made their relationship social media official on February 11 this year, with a black and white shot of them kissing. The cookbook author and the actress then wed in a low key ceremony on February 22. Dressed in Monique Lhuillier Schumer and The Beetlebung Farm Cookbook author tied the knot with friends Jennifer Lawrence, Jake Gyllenhaal, Judd Apatow and Chelsea Handler attending the intimate ceremony.